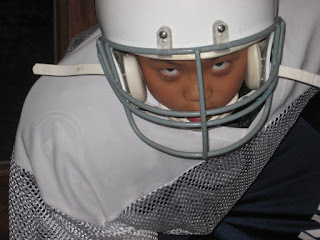 Jimmy started his football career in the 3rd grade as a black stripe, all in kind of kid and he ended his HFL career as an all in 6" tall 160 pound force on the field both offense and most definitely defense. Jimmy was by far the most engaged, alert and demanding kid on the field. He was not the fastest, but he knew where every play was for 6 years, poured his heart and soul into the game and he loved it!! He played in two countries and for two different teams and was totally into it. His team won the city tournament in Toronto the first year we were there and then came in second the second year. Jimmy was the kid that ALWAYS knew the score and led the team in the pre and post game cheer (who who who - who are we? HOPKINS! who are we? HOPKINS! Go.....Hopkins!) He cried when they lost and there were MANY a day in 3rd, 4th and 6th grade football where we couldn't get him out of the car after a loss. We'd have to have the coach call and talk him off the proverbial ledge. But, he was also the kid that encouraged his team mates, told them 'good job' and 'its ok'. 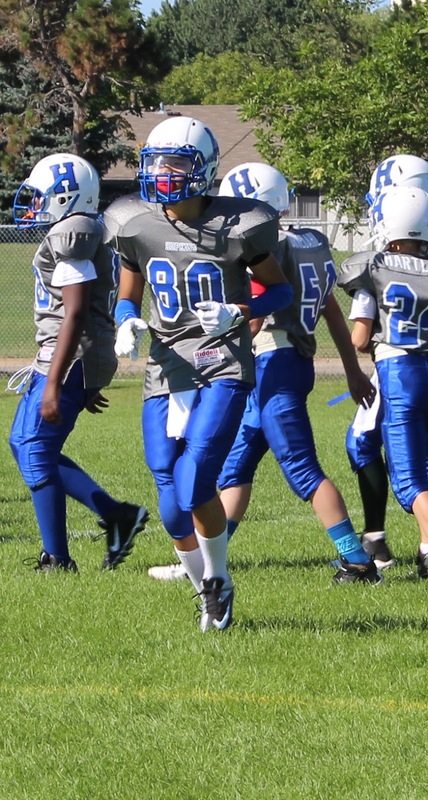 He was voted one of the team captains this year and he was thrilled with his leadership role, especially the responsibility of talking to the refs on behalf of the team. Lets just say that didn't always go in his direction but he wasn't afraid to state his point of view (an understatement). He's been lucky enough to play with the same kids/coaches for most of that time and they have all been class acts. Fun, learning and family was always 1st on the agenda and then, if they worked hard, they won. His coaches are remarkable, giving up personal time, year after year to encourage kids, teach them the science of football and spark the passion in the game. Cant wait to see what is in store for us in 9th grade football next year. Go Hopkins!! Happy Birthday 80th Jerry and Kay!